[SINGAPORE] The ongoing push to promote continuous education and training (CET) among workers is critical, especially in an era when knowledge becomes obsolete much faster. Making this point yesterday, Prime Minister Lee Hsien Loong said that Singapore has been doing this for some time already, with some good results so far. The government has invested $300 million to build two massive CET campuses - one in Paya Lebar and the other in Jurong East. Before he delivered his May Day Rally speech, Mr Lee officially opened the latter campus, called the Devan Nair Institute for Employment and Employability. The seven-storey facility, located just across the street from IMM mall, is named after the first National Trades Union Congress (NTUC) secretary-general. The late Mr Nair, the third president of Singapore, died in 2005 at the age of 82. During his speech, Mr Lee said the aim of having the CET campuses was to put training providers, career counsellors and classrooms under one roof. "(This) makes it easier for workers to find the relevant trainer, and for trainers to work with workers to develop relevant courses," he said, adding that workers also get access to job matching and career development services. Mr Lee said it was "fitting" to name the 30,000 square metre institute in Jurong East after Mr Nair, whom he described as one of the country's pioneer union leaders. "(He) was pivotal in forging a united and forward- looking labour movement. The institute is a good way to honour (his) spirit and contributions, as a teacher and unionist," he told his audience that included two members of Mr Nair's family. 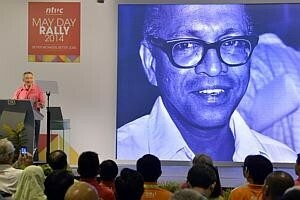 In a statement, Mr Nair's son, Janadas Devan, said his family was honoured that the labour movement had chosen to pay tribute to the pioneer generation of Singapore's trade unionists by singling out his father. "That generation helped to build the Singapore we know today by infusing in the workers they led a sense of co-ownership. This Singapore does not belong only to the bosses but also to all workers," said Mr Devan, currently the chief of government communications at the Ministry of Communications and Information. "It is not only the government and employers who are responsible for our well-being but also organised labour," he added. The Devan Nair Institute aims to train some 100,000 workers this year alone. The second CET campus in Paya Lebar, called the Lifelong Learning Institute, is run by the Singapore Workforce Development Agency (WDA) and will open later this year. Mr Lee said these two campuses reflect the commitment to invest in workers and help them improve their skills and stay employable. He encouraged more people to make use of the facilities and services, and to make the effort to upgrade themselves, learn new skills and apply them at work. "We can't tell our competition to go away. They want to eat our lunch, we know that. They want to eat our dinner, we suspect that. We can't stop them from wanting, but we can make sure that we can hold our own and we will eat our own lunch," he said. "We can provide you the resources and the means to stay one step ahead of the competition, and we will have a Singapore system that we can work together to build, to maximise your potential and contributions."